One outcome of this study is that such an accumulation of weapons also poses dangers in times of peace. They threaten the environment and represent a high risk to security, particularly in view of the activity of international terrorist groups. The disposals of such weapons necessitates a collective, international effort. 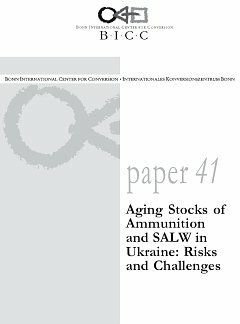 The research to this paper, which is the first comparative study on the topic of the disposal of surplus stocks of ammunition and small arms in the Ukraine, was carried out by the Razumkov Centre, supported by the NATO Partnership for Peace (PfP) Trustfund and the NATO Maintenance and Supply Agency (NAMSA). This study also shows that lessons can be drawn from mistakes made in the past and that the Ukrainian government itself must show that it also has a stake in contributing to these efforts, for instance by establishing a state disarmament agency that provides for transparence and commitment in the disposal process and that is contact point for international donors. What is also necessary is the reduction of bureaucratic barriers and the bearing of a share of the costs for disposal. The reduction of the armament burden and the heritage of the Cold War will be one central aspect of Ukrainian-European rapprochement.